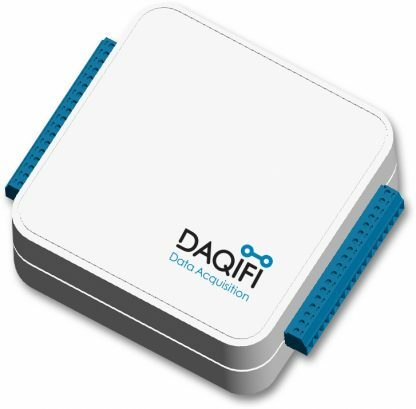 The DAQifi client software can connect to a multitude of devices on the network whether a traditional desktop PC, laptop, tablet, or smart phone. Because the Nyquist connects wirelessly, many devices can be deployed and are able to connect to the same client. This is one of the most exciting aspects of the Nyquist since this no longer requires a dedicated PC plugged into each data acquisition solution. Many experiments, machines, robots, etc. can be connected to the same client at once! The Nyquist is completely wireless, utilizing a built-in Li-Ion battery for power and an 802.11 WiFi connection, allowing it to be deployed virtually anywhere and everywhere. Since it uses the 802.11 standard, it can be used on the WiFi network already implemented in many facilities.